Goleta Valley Dog Club, Inc, was founded by a group of individuals devoted to having fun with their friends; both two and four legged. We take great pride in providing an atmosphere that is beginner, family and community friendly while also providing a place for our more advanced dog sport athletes to practice and learn. Our members enjoy many forms of participation, whether it’s a fun-filled hour each week in the park with their dogs, or preparation for the Agility National Championship events. Our Instructors compete at national agility competitions all over the country, having won several National Championship Event Finals and numerous champion titles. We currently offer weekly classes in dog sports such as Dog Agility, and occasionally in Rally Obedience. For a newer type of training class to help make your dog a better family member or more focused teammate, try our Fun with Focus or Reliable Recall sessions. For those looking to help create an obedient and trustworthy canine or are considering trying therapy work with their friendly dog, consider our AKC Canine Good Citizen class session. Our classes are open to everyone including, purebred or mixed breed dogs, dogs and owners of any age and any level of ability. Agility, Rally, Focus and Recall classes are available from beginning levels all the way up to advanced. Classes are taught by knowledgeable and experienced instructors who are committed to providing quality lessons that are informative, safe and fun. Agility, Rally, and Focus classes are held on various mornings, afternoons, and evenings during the week at Girsh Park in Goleta. Please check our “Classes” page if you’d like more details and the “Calendar” page for class schedules. We also offer weekly club agility practices for dogs that have completed introductory agility classes with GVDC or another organization. We also offer Agility and Rally Pay ‘n Plays, seminars and workshops, private training and occasionally sanctioned ASCA Agility and APDT Rally Trials as well. We look forward to hosting UKI Agility in the near future. GVDC was founded by friends who wanted a fun place to play with and train their dogs in a welcoming and casual atmosphere. The current list of Instructors include Mia Grant (Agility Instructor), Anne Swan (Agility, Rally, CGC Class, and Fun with Focus Instructor), Dee Honer (Fun with Focus and Reliable Recall Instructor) and Kelly Stark is our Membership Director and Agility Practice Coordinator. Mark Granaroli is a co-founder and current GVDC President. Mark, Anne and Mia continue to devote themselves to the club and its direction. It is this committee that makes the decisions for the club based on their general consensus. In the case that they feel as though there is an issue that should be brought before the entire club, the committee will call a club meeting. They welcome thoughts, ideas, questions or comments and any help that you feel as though you can provide. Any and all members of the committee can be contacted at Zipnkiwi@aol.com. There are a number of benefits to joining GVDC. Members can attend practice sessions at no cost and receive discounts for classes, workshops, Pay ‘n Plays and seminars. Members can also participate in club demonstrations and are invited to submit a photo for our online photo album on the “Our Dogs” page. We also throw a party or two each year! Memberships are renewable every year in September and dues are $50 a year, per family. If you join the club June-August, pay just $25 and then renew in September with a $50 dues payment. Members may also want to purchase a club T-shirt (which you’ll need to wear at club demos) for $10. Number one rule is—Have Fun! Remember: GVDC strives to provide an atmosphere that is family friendly and strives to promote positive relationships with the community. Members are expected to help with equipment set up and/or take down for classes, practices, demos and Pay ‘n Plays. Make sure you have provided current information and have signed the needed releases on our member information form before you and your dog play on club equipment. Wait your turn…be aware of others around while on equipment and on course. Do not attempt to use equipment that is new to you and your dog without an instructor’s prior approval or consent. Appropriate dog-wear equipment for Agility, Rally, and Obedience Classes, practices, demos, and Pay ‘n Plays include: flat buckle collar, 4 or 6 foot leash, front-clip harness (Easy Walk or Sense-ible), a Gentle Leader or Halti head collar. 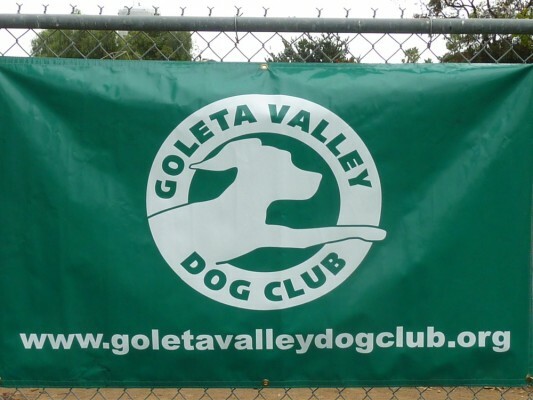 Dogs deemed aggressive or problematic by Goleta Valley Dog Club, Inc. are not allowed at any GVDC classes, events, or functions of any sort. We reserve the right to refuse or revoke membership if necessary for the safety of everyone. Pick up after your dog when it potties. If it urinates on equipment pour water over the spot and spray with the Lysol provided in the club trailer. Keep non-working dogs under control with ex-pens, crates, tie-down ground stakes or hold your dog(s). At GVDC practices, classes, demos and Pay ‘n Plays we must be considerate of our neighbors, please keep non-working dog(s) barking to a minimum. Citronella bark collars are permitted on non-working dog(s) only. You may also ask someone to feed treats to your dog that you provide, in order to keep your dog quiet while you work. Dogs must be current in all locally required vaccinations. Make certain to talk with your vet about your dogs activity level and articulate that you participate in group activities with your dog. Handlers must be GVDC members to participate. Handlers must wear a club tee or sweat shirt. Please help with equipment set up and take down. Dogs must wear flat buckle collar. Dogs deemed aggressive or problematic by GVDC are not allowed to participate. Muzzles and remote collars are not allowed. Please bring water and a bowl for your dog. Please bring an ex-pen or crate. Wear good shoes…we recommend running shoes. For general information about the sport of Agility, visit our Agility page. Class descriptions can be found on the Classes page. Class schedules can be found on the Calendar. For general information about the Rally, visit our Rally page. Class descriptions can be found on the Classes page. Class schedules can be found on the Calendar.